A private reading is an affordable, yet effective way to understand yourself and your direction. If you currently seek guidance or insight regarding your life path, relationships, health, business, or romance begin your journey of understanding with a personal telephone reading with Noreen Renier. 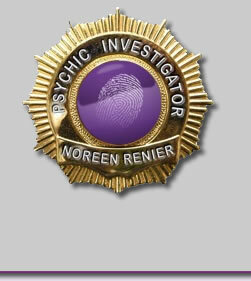 We appreciate your e-mail request for a private telephone reading with Noreen Renier. Please read the following instructions and follow them carefully. Lock of your hair: It is important to wrap each hair sample in aluminum foil. Up to three different hair samples may be included per reading, and samples may include two other people. Just mark each sample on the outside of the foil with the name or first initial of the person. If hair samples are not available, please include a recent photo of him/her and mark the photo with name or initial. Please DO NOT send your photo for this reading. Ms. Renier, as a warm-up exercise, will describe your facial characteristics and tell you a little about yourself. Be sure to include your phone number so Ms. Renier can call you to set up your appointment. If you want the items returned please have self addressed envelope with postage included. Questions: Be prepared for your reading. The specific questions are not to be yes or no questions. Questions that seek facts or developmental information are important. You may ask as many questions as you want during your session, but please send 10 questions along with your hair and fee. Your environment should be serene during the reading. Turn off cell phones and any background noise during the session. Have family members in another part of the home or send them to the movies. The less you tell Ms. Renier about yourself before or during the reading, the better. The session begins by describing you to some extent, including a few body scars or unique markings. Use this time wisely. We do not want to spend too much time in one area if you have several concerns. Feel free to make notes during the session, in the event you may want to return to a specific concern. Please, if possible tape record the phone session. Noreen Renier makes no claim of being 100% accurate; nor does she claim to be capable of reading all people equally. A reading consists of a group of impressions that are merely possibilities at this time. You always have choices and are free to make those choices, which can totally affect anything she my see today. Remember: as for all of us, your future remains yours to decide.